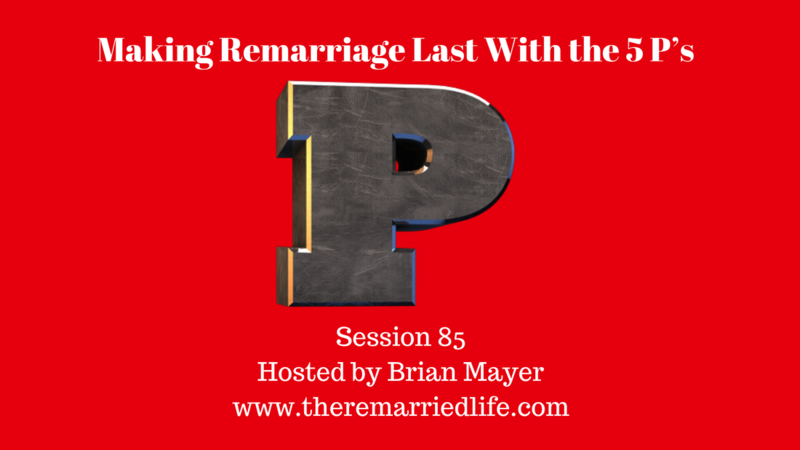 We speak often on this podcast about how the divorce rate for each subsequent marriage gets higher and higher. The purpose of this podcast is to help you beat these odds and so that we can reduce this rate one couple at a time. So this is all great in theory but lets get down to business and talk about the ways we can achieve this. Patience is probably the foundational piece of the puzzle when it comes to going the distance. I ran my first marathon a couple of years ago and for sure the training was long and there were many ups and downs. In fact it took 6 months of training to run the 4 hour race. A remarriage is quite similar. You are going to be fighting against all sorts of issues with your spouse, your children, your stepchildren, the exes, the parents, and the list goes on. Short of abuse and infidelity, get pushing. Stay in this thing. There were times I wanted to give up for sure, but did not and now I am on the other side reaping the rewards. Person is a strange word, but the idea here is get to know the quirks and differences of every person in your new family. If you know one child likes putting puzzles together, then spend some time with them doing this. If they like going outside to play ball, then do this with them. Now I am not saying you need to be a friend and be at your child’s beck and call, but pick some times where you might do this. Presence – Just being there is very important. If you travel a lot or work long hours this is going to be very tough, but try find time to spend with your spouse and with each child. Be creative if you are away. Maybe do an online call where at least your face is seen by the family as just a check in. Try to do this at least once a day again if you are working late or are away. Don’t make the entire time talking about homework and the rules, but spend time encouraging each child regarding the things they are doing in school and with extra curriculars. Present – This has all to do with being mentally there with your family. Sometimes if you have big projects going on at work, you might have a difficult time turning that off. It is amazing how many people mentally we invite into activities that aren’t really there. I have an amazing mini-series on implementing mindfulness into your life and relationship. The links are below in resources. Perseverance – this is where we come full circle from where we started. Patience and Perseverance kind of goes hand in hand but each are a bit different. The dictionary definition for patience is “the capacity to accept or tolerate delay, trouble, or suffering without getting angry or upset.” The definition for perserverance is “persistence in doing something despite difficulty or delay in achieving success.” As you can see this one is much more proactive whereas patience is more about being reactive or actually.